Piccolo Scores 28 Points to Lead Ursuline ! 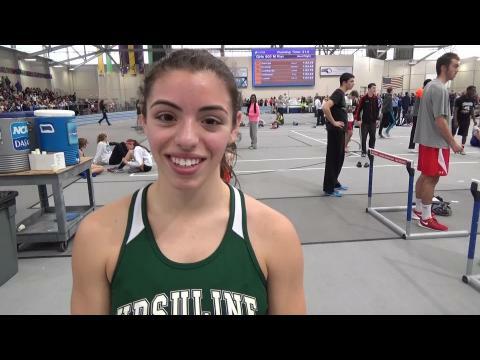 In one of the most anticipated events of the meet, the Ursuline Academy sophomore shot into the lead of the 600 and turned away challenges from defending champion Danielle Griffin of Norwell and Narragansett’s Krista Webb for a decisive 1:36.16 win. Webb was second in 1:36.74 and Piccolo’s teammate Merissa Wright clinched third in 1:37.81. The 300 was never in doubt as Piccolo simply sprinted away from the field for an easy 41.3 victory. Wright was a strong second in 42.43 and Tiffany Tenney of Mahar nailed down third with a 42.79. She then took second in the long jump with a leap of 16-9. Manchester-Essex’s Olivia Lantz likens dipping under the 5-minute mile mark to being alone on a frozen pond with the ice cracking all around. The talented sophomore certainly made a splash into the cold water last night. 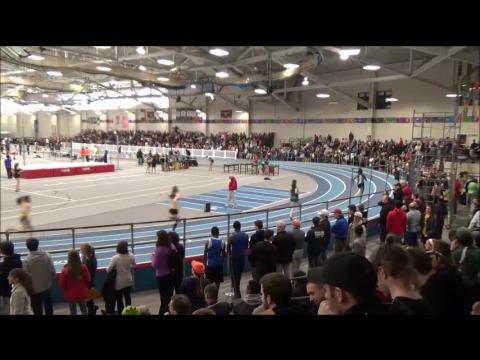 Racing on the fast Reggie Lewis oval, Lantz sprinted away from a strong field to capture her specialty for the second year in a row with a meet record time of 4:58.39. 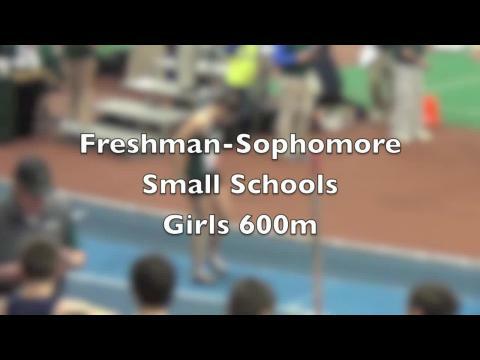 Lantz’s time was a personal best, marked the first time she’s broken the magical 5-minute barrier and bettered the 5:02.69 record of Bromfield great Ari Lambie in 2002. Newburyport boys defended their team title with 44 points to defeat Old Rochester (44) and Weston (42). Emily Dawidczyk of Oxford won the 55 dash in 7:33 while Old Rochester’s Ally Saccone was second in 7.47. The finishes were reversed in the 55 hurdles with Saccone coming away with the gold in 8.44 and Dawidczyk clinching the runner-up position at 8.47. Dawidczyk then took her talents to the long jump pit and came away with a big win with a leap of 17-8-1/2. Piccolo was second and Griffin’s 16-6-1/2 earned her the bronze medal. 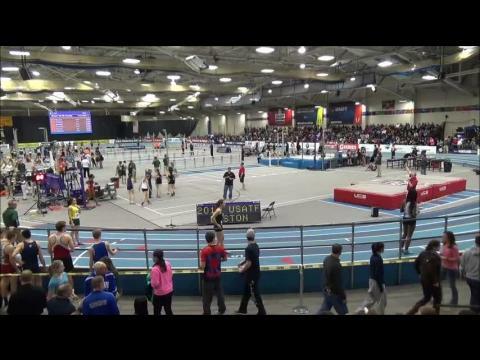 Austin Prep’s Joe Luongo won the 600 in 1:23.12 to edge out Patrick Griffin of the Bromfield School’s 1:23.61. Jason Dimmick of Sutton was a close third in 1:24.48. Weston’s Matt Herzig was never challenged in the 2 mile, running away to a 9:32.87 victory. Price Day of the Bromfield School took the silver medal in 9:49.41 with Bedford’s Sam Bradford sprinting to third in 9:52.31. Seekonk’s Nate Robitaille was challenged in the shot put, but that didn’t stop him from defending his title with a strong heave of 54-3-1/2. Newburyport’s Steve Preston was second with a 52-6-1/2 effort. 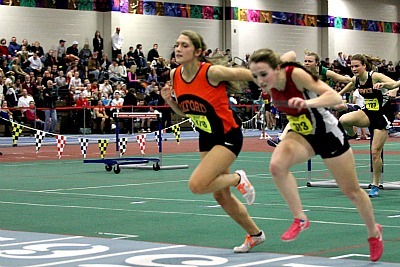 Emily Cahill of Uxbridge cleared 5-4 to win her fourth consecutive division title, destroying the rest of the field by more than four inches. 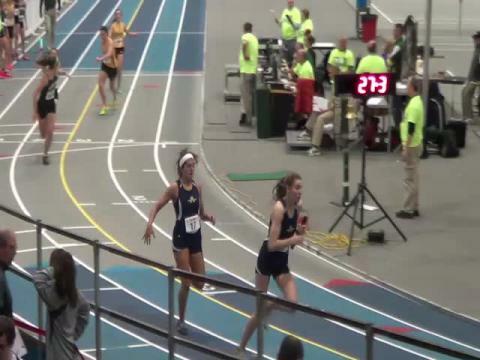 Jane Clark of Notre Dame of Worcester ran a strong final straightway to win the 1000 in 3:00.94. Ursuline’s Maddie Wolfe was second in 3:02.65 and Brook Hansel of Lunenburg was third with a time of 3:02.70. 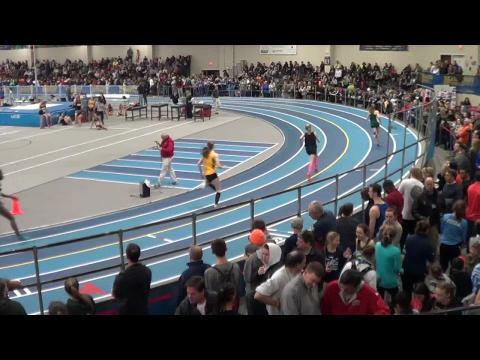 In the 2 mile, Erin Dietz of Bedford didn’t give anyone a chance, lapping the field for a sterling win in 10:41.13. Anna Capps of Narragansett was second in 11:29.48 and Arlington Catholic’s Janelle Soviletti took the bronze in 11:33.81.